This time of year is hectic. There are never enough hours in the day to get everything done, there are always so many events happening, so much shopping to do (for gifts, groceries, you name it), and you still have to work and do regular life things on top of it! 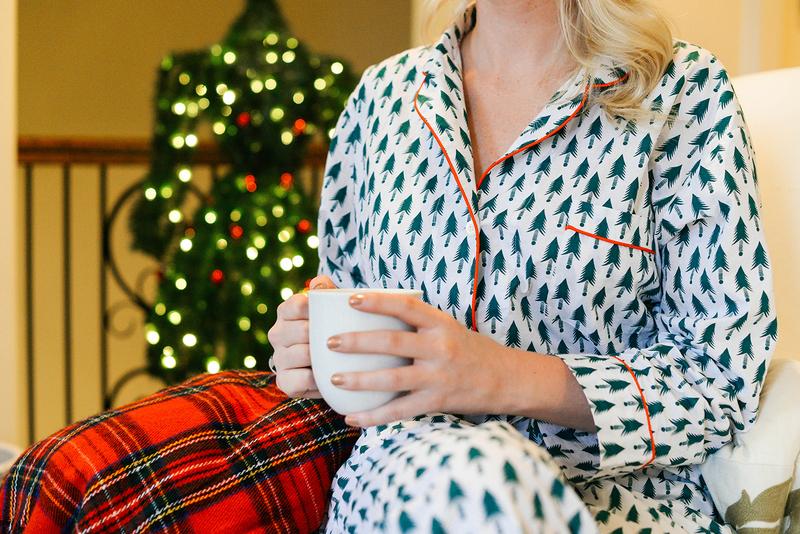 I thought I’d take a step back today from the usual content you’re used to seeing on here and share some tips with you on how to survive the craziness of the holiday season and come out of it fresh as a daisy. There are two arguments for this. First, it’s a no-brainer to shop online for holiday outfits and clothes this time of year, simply to avoid the crowds and stress at the mall. Am I the only one who gets totally worked up over finding a parking spot? With the free shipping + returns most websites offer these days, ordering online is hassle free! You’re almost always guaranteed to find better deals online than you will in store too – that’s what Google is for! If something doesn’t work, just put it back in the box and drop it off at UPS with the free shipping label. The second reason to shop online during the holiday season is to have somebody else do all the gift wrapping for you! Not only does it keep you comfortably on the couch at home while you shop, but you also get your gift wrapping done all in one fell swoop. Most (if not all) department stores and online boutiques offer gift wrapping (and a lot of times it’s free)! This season, don’t worry about buying gift wrap materials or setting aside time to wrap each gift individually. Save time and stress by having someone else do it for you! As I mentioned in this post, I really enjoy wrapping gifts, but I’m not the best at it – if I’ve purchased the gift from somewhere offering free gift wrapping, you better believe I go with that option. If you need some inspiration on what to gift everyone on your list, check out all of my holiday gift guides! While you probably want to wait to shop for the ingredients so they’re fresh, go ahead and print out or bookmark the recipes you’re planning to make. My mom actually tests recipes out first before committing to them, which helps reduce stress the day of – you already know how it’s going to turn out! You could also go ahead and shop for dry ingredients, oils and other random ingredients that are necessary for your recipes, so that you don’t have to waste time at the packed supermarket looking for various spices or ingredients you don’t already have in your pantry. Make sure you have enough flour, sugar, chicken broth, etc – shopping for these items early will keep you from having to make multiple trips the week of Christmas! Plus, if you shop early, you’re more likely to get exactly what you want. Popular items may sell out the days before Christmas! One of my favorite ways to de-stress is to work up a sweat. Whether that’s with a quick 45 minute spin class or a long walk with your mom, you’ll release endorphins. In case you missed the movie Legally Blonde, endorphins make you happy! Plus, you won’t feel as guilty indulging in your favorite holiday treats if you stick with your workout routine throughout the holiday. It also gives you a chance to reset – clear your mind, get really into the music on your playlist, and move. Just get up and go! You do NOT have to attend everything you’ve been invited to. While you may feel guilty about missing a friend’s cocktail gathering, if you’ve got two things already going on that night, it’s not worth the stress of checking your watch every five minutes and scrambling to get hostess gifts for every single party. You’ll enjoy the events you attend much more if you have time to talk to everyone and don’t feel rushed! It’s totally okay to say “No”. Something that takes up very little time but is incredibly meaningful? How about sending holiday cards to our troops overseas? What a better way to show your appreciation for their dedication and bravery, than to remind them we are thinking about them and praying for their safety over the holiday season (and every day)! While December 1st was the deadline for getting the letters in time for Christmas, I don’t think there’s anything wrong with sending them a little late – you could always send a New Year’s card! Check out A Million Thanks to see where there’s a drop-off location in your area! Every year my family gathers to adopt a family. It’s such a special way to give back, because you get to take the gifts you purchase for the adults and their kids to their homes. Most of these families do not have the resources to buy gifts for their kids, and certainly not for themselves. By adopting a family during the holidays, you put the gifts under the tree for every member of their family! Seeing their faces light up (and in many cases, tear up) and knowing you’re making a difference in their lives (or at least on Christmas Day) is something you’ll never forget. In Austin we use Operation Blue Santa, but do a little research in your own city to find a program near you! Donate coats and other cold-weather items to Goodwill’s non-profit arm. Coats are something everyone needs during the winter season, especially the homeless and low-income families. It’s a great way to give back without spending money (if you don’t have the budget to give gifts or donate money to charitable causes). Volunteer at a soup kitchen, homeless shelter or a domestic violence shelter. As much as it is nice to give money, I personally find it equally meaningful to spend time with those people who don’t get to experience a regular Christmas holiday like you do. Planning to host Christmas lunch at your house for the first time ever? Don’t be afraid to ask for help! Recruit family members to bring certain items, have your kids or siblings help you in the kitchen (or by cleaning up the living room), and ask your beau to run any last minute errands for you. Don’t try to take on everything yourself! That’s a surefire way to make you go crazy. Hand in hand with “ASK FOR HELP”, not everything has to be perfect. If the flower arrangements aren’t exactly how you wanted them, don’t worry about it. You’re probably the ONLY person who is going to notice if the arrangement needs rearranging. Especially when dealing with family and close friends, I promise you they do not care about how fabulous your house looks. They’re just excited to spend time with you and enjoy some good food, and perhaps open a few gifts! It’s OK to let a few things go. Just remember what the holidays are really about! PS – another way to reduce holiday stress is to reduce the financial stress behind all of it! Don’t forget to enter my $500 Nordstrom gift card giveaway over on Instagram! Click here for all the details on how to enter. All such great tips! I find not overscheduling to be really important as well as planning recipes ahead. Hope you’re having the best season! Really great tips. I enjoyed reading this.